SEOUL, April 10 (CGTN) -- Democratic People's Republic of Korea (DPRK) leader Kim Jong Un on Tuesday called on senior officials to display the spirit of self-reliance and fortitude under the prevailing “tense situation,” reported the Korean Central News Agency. Kim made the remarks at an enlarged meeting of the Political Bureau of the Central Committee of the Workers' Party. 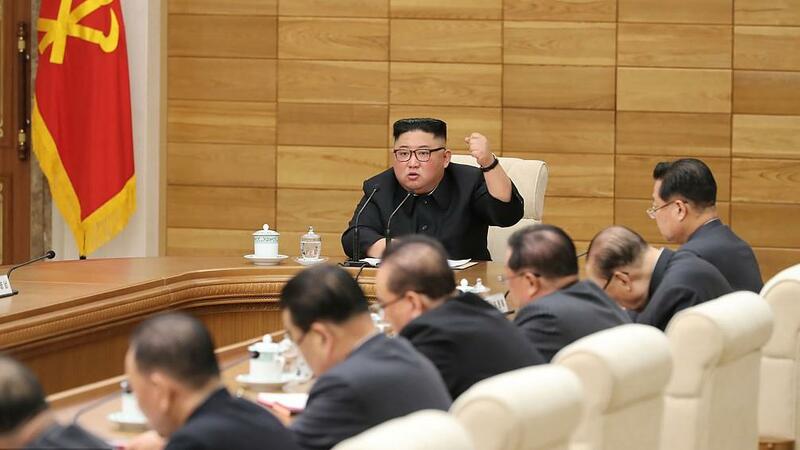 "The Supreme Leader urged the need for leading officials to fully display a high sense of responsibility and creativity, and the revolutionary spirit of self-reliance and fortitude in an attitude befitting the masters of the revolution and construction under the prevailing tense situation and thus follow through on the new strategic line of the party," said KCNA. The new strategic line apparently refers to a decision the party made last April to focus more on economic development, said Yonhap News Agency. The KCNA also said that a plenary session of the ruling party's central committee will also be held Wednesday "in order to discuss and decide the new orientation and ways of struggle in line with the need of the prevailing revolutionary situation." The gathering of the central committee comes after Kim's Hanoi summit with U.S. President Donald Trump broke up without agreement in February, and as Republic of Korea (ROK) President Moon Jae-in flies to Washington for talks with Trump.